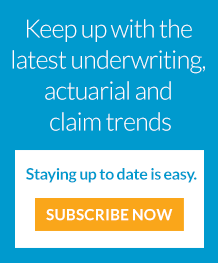 While insurers enjoyed a rather uneventful hurricane season in 2013 compared to recent years, the issue of causation remains an omnipresent source of dispute between policyholders and carriers across the entire spectrum of first-party property claims. From wind and water claims to collapse and time element claims, the issue of causation is the starting point for any coverage determination, forming the basis from which all other issues will be resolved. This much is clear: Under standard “all-risk” policies, risks of direct physical loss are covered unless excluded or limited.1 What is less clear is whether a given loss falls within the purview of a policy exclusion or limitation. Just as there are no absolute truths, catastrophe losses rarely involve a situation where the loss is solely caused by an excluded peril. Even where an excluded peril appears to clearly cause a loss, a causal relation back to a covered peril almost always exists. And, vice versa, excluded perils almost always contribute in some “but for” manner to catastrophe losses. Take, for example, a flood loss. Certainly, damages caused by flood are generally excluded under standard property coverage forms under a water exclusion.2 However, any damage caused by flood is usually precipitated by high winds and substantial rains, perils that are generally not excluded events. Thus, a determination must be made as to the cause of loss in order to determine whether coverage is afforded. This article addresses the application of anti-concurrent causation clauses (“ACC clauses”) in property coverage forms to resolve such disputes, judicial treatment of such clauses, and the impact of proposed legislation on existing and future catastrophe claims. The efficient proximate cause doctrine, on the other hand, takes a more balanced approach to causation disputes. Where a covered peril and an excluded peril combine to cause a loss, coverage is afforded only if the covered peril was the efficient proximate cause of the loss, defined generally as “the predominating cause of the loss.”4 Thus, where a covered cause of loss only remotely contributes to a loss, coverage is not afforded. In order to contractually resolve the uncertainties associated with judicial interpretation of policy exclusions,5 most standard policies now include ACC clauses that provide where an excluded peril contributes “directly or indirectly” to cause a loss, then coverage is excluded “regardless of any other cause or event that contributes concurrently or in any sequence to the loss.”6 ACC provisions usually serve as a lead-in clause to a set of exclusions, and may not apply to all policy exclusions.7 For exclusions that are not preceded by an ACC clause, the jurisdiction’s default standard for resolving causation disputes will likely apply. Facially, ACC clauses appear to broaden the reach of applicable exclusions to all losses even remotely related to excluded perils, regardless of the “predominating cause” and regardless of the sequence in which the excluded peril contributed to the loss. However, a meticulous deconstruction of ACC clauses reveals limitations that have been observed by courts. ACC clauses apply where two perils contribute to cause a “loss.” Thus, application of ACC clauses turns on identification of the “loss,” a term that is rarely defined in insurance contracts. Where it is possible to apportion the damages between the perils, ACC clauses are not implicated as there are two separate losses. ACC clauses are only implicated where two perils contribute to cause one loss. While in theory such a determination appears simplistic, in practice the task of identifying a “loss” can be difficult and contentious, especially where damages occur incrementally. For example, following Hurricane Katrina, courts were faced with a recurring fact pattern: High winds caused extensive damage to countless homes, causing damage to roofs and ensuing rain damage. Thereafter, storm surge and flooding engulfed the buildings, resulting in total losses. In these situations, do the damages amount to one loss for which the ACC clause bars coverage? Or do the damages that occurred prior to the flooding amount to separate and distinct losses for which coverage is owed? If the latter, how would the loss be valued since the damages are indivisible? Drawing on judicial opinions that were issued following Hurricane Katrina, in the aftermath of Sandy policyholders have sought to avoid the preclusionary effect of ACC clauses by claiming coverage for wind damages that preceded damages caused by excluded perils, most notably flood and storm surge. Where the damages were indivisible, policyholders claimed entitlement to full coverage on the theory that it is the insurer’s burden to prove exclusions from coverage. Insurers, on the other hand, have contended that ACC clauses plainly exclude coverage where excluded perils contribute in any way and in any sequence to cause a loss. Policyholders have drawn on Corban and its progeny in support of the proposition that damages caused by wind or rain prior to other excluded perils are covered. Carriers have pushed back, noting that Corban is an outlier case that is at odds with decisions from Sandy-impacted states that have enforced the plain meaning of ACC clauses. For example, in Assurance Co. of America, Inc. v. Jay-Mar, Inc., 38 F. Supp. 2d 349 (D. N.J. 1999) (applying New Jersey law), a federal district court examined separately the “concurrently” and “in any sequence” language in the short form of the ACC clause, and concluded that both provisions were enforceable. With regard to the “in any sequence” portion, the court found that the majority of states that had adopted the efficient proximate cause doctrine permitted policy provisions designed to avoid coverage where a loss was due to sequential causes. Finding that New Jersey would follow the majority position favoring freedom to contract, the court concluded that the “in any sequence” portion of the ACC clause did not violate New Jersey public policy. See also Casey v. General Acc. Ins. Co., 178 A.D.2d 1001 (N.Y. App. Div. 4th Dep’t 1991) (ACC clause operated to preclude coverage where a loss resulted directly or indirectly from surface water, regardless of any other cause or event contributing concurrently or in any sequence to the loss); Amherst Country Club, Inc. v. Harleysville Worcester Ins. Co., 561 F.Supp.2d 138 (D. N.H. 2008) (Public policy does not preclude enforcement of anti-concurrent cause exclusion that excludes property insurance coverage for any loss caused “directly” or “indirectly” by any event within specified exclusions, regardless of other causes or events that contribute concurrently or in any sequence to the loss). Similarly, in Morgan Lehman Gallery LLC v. Hartford Fire Insurance Co., No. 653991-2013 (Nov. 19, 2013 N.Y. Sup. Ct.), the plaintiff is a New York City art gallery that sustained business interruption losses following a fire that occurred while Sandy affected the region. Although the insurer provided coverage for some of the losses, the insured claims that the insurer breached the contract by denying part of the claim based on an ACC clause. It remains to be seen how the courts will treat the policyholders’ respective arguments in these cases, especially in the context of the extensive damages caused by Sandy. While various arguments have been raised in an effort to secure coverage, the purpose and the plain language of ACC clauses is to resolve uncertainty when multiple perils contribute to cause an indivisible loss. 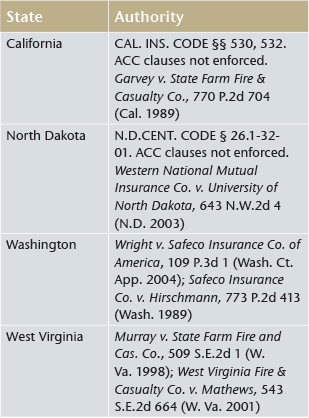 They are particularly pertinent in catastrophe losses–like Sandy–where it is often impossible to distinguish between covered and uncovered damages.14 Given that most of the states impacted by Sandy have enforced the plain meaning of ACC clauses, it is anticipated that carriers are well positioned to defend the enforceability of ACC clauses for Sandy-related claims and future catastrophe losses. Perhaps even more illustrative of the enforceability of ACC clauses is the legislative response following Sandy. In the aftermath of the extensive damages caused by Sandy, there was intense political pressure on state legislators to alleviate the exclusionary effect of ACC clauses on commercial and personal lines claims. In response to these calls for reform, legislatures in several states proposed statutory prohibitions on such clauses, while acknowledging and accepting the exclusionary impact of ACC clauses on Sandy claims in their states. Legislators in New York, for example, proposed legislative restrictions on ACC clauses. The bill stalled, and on January 22nd was returned to the Committee on the Assembly Insurance. Similarly, on September 9, 2013 a New Jersey Assemblyman introduced legislation that would prohibit inclusion of ACC clauses in homeowners policies. The bill expired at the end of the 2013 session, and was re-introduced on January 16th. No laws have been passed in New York or New Jersey. 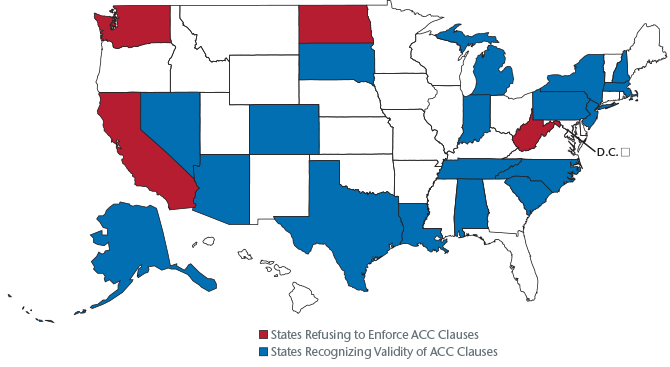 Even in states that may enact legislation prohibiting ACC clauses, constitutional challenges would face any legislation that sought to retroactively proscribe ACC clauses. In Maryland a new law was passed in May 2013 requiring insurers to provide annual notices to policyholders that explain the impact and scope of ACC clauses. The law does not otherwise restrict or limit the enforceability of these clauses. Treatment of ACC clauses is state-specific and will usually turn on the specific facts of the case and language of the policy. While a few courts have sought to carve out exceptions in an effort to find coverage for policyholders, most courts have enforced the plain meaning of ACC clauses as excluding coverage where multiple perils contribute concurrently or in any sequence to cause a loss. With Sandy disputes now making their way into litigation, it is anticipated that additional judicial guidance will be forthcoming on the enforceability and scope of ACC clauses—with regard to both Sandy claims and future catastrophe losses. William Krekstein and Emmett McGowan are attorneys in the law firm of Nelson Levine deLuca and Hamilton in their Blue Bell, PA office. Both Bill and Emmett represent clients in first-party coverage and bad faith disputes. They focus on the business of insurance through eliminating and minimizing contractual exposure, defending against unfounded bad faith claims and identifying instances of insurance fraud. Both also have a substantial practice focusing on commercial property and liability coverage disputes. You can contact Bill at 215 358 5165 or bkrekstein@nldhlaw.com and Emmett at 215 358 5135 or emcgowan@nldhlaw.com. Nelson Levine deLuca and Hamilton specializes in insurance litigation and coverage work, with offices in New York, New Jersey, Pennsylvania, North Carolina, and Ohio as well as the District of Columbia and London.